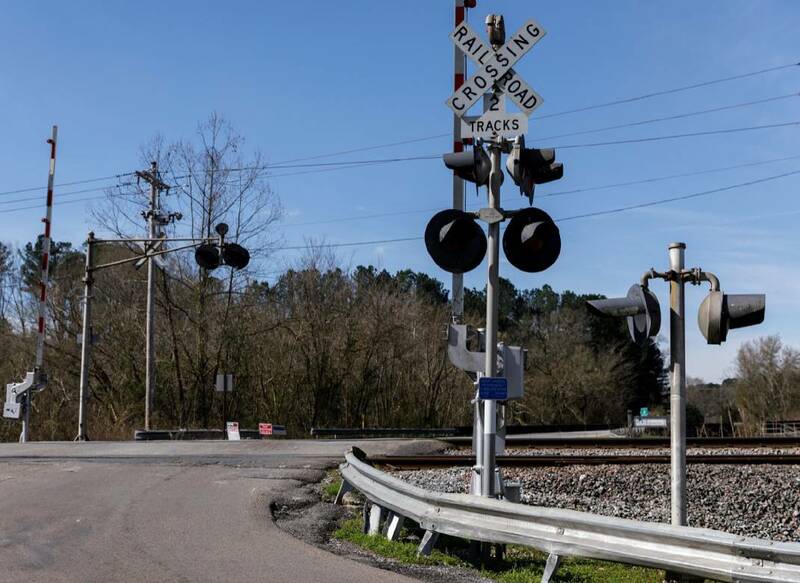 The Graysville Road railroad crossing is seen on Tuesday, March 12, 2019, in Graysville, Ga. Catoosa County Commission Chairman Steve Henry wants to add a bridge over the tracks to mitigate long wait times at the crossing. This story was updated Wednesday, March 20, 2019, at 12:29 p.m.
RINGGOLD, Ga. — Voters deflated the Catoosa County Commission's effort for a new transportation tax Tuesday. According to unofficial results, residents overwhelmingly voted "no" on the referendum, 4,833-1,399. The 1 percent sales tax would have produced funds designated for infrastructure projects — particularly road pavings and bridge building. About 14 percent of the 41,752 registered voters in the county showed up at the polls. County Commission Chairman Steven Henry, who advocated for the tax, was surprised by the landslide. He thought voters would approve the referendum in a close race. He said the special election became more contentious than he expected, with opponents protesting at commission meetings this year. As far as campaigning, he would not have done anything differently. "I assumed people cared about their county more," he said Tuesday night. "To me, I want to see my county have a little better. I want to see the roads get caught up from when we had a recession. I definitely wanted to see the [Graysville] bridge project done because that's something people have dealt with and complained about all my life. I figured the people who were for it would get out. "It doesn't matter, we're going to move right on and keep on doing what we're doing." The Catoosa County Chamber of Commerce endorsed the tax, and developer Emerson Russell campaigned hard for it. But local Republicans, including members of the Georgia Republican Assembly, lobbied against the new tax. "We've been promised that these roads were going to get fixed at other times with other tax hikes and allocations of money," said Joanna Hildreth, one of the tax's opponents. "Nothing's happened yet. We don't trust that it's going to happen this time." Commissioner Jim Cutler, who has represented District 3 since 2009, had not seen a countywide sales tax referendum defeated before now. He called the loss "a sign of the times." "In the media, people see a lot of negative reporting," he said. "And they get very, very cautious. And they get a little frightened about the economy and what's going to be happening, even though everybody says it's a great economy." Henry began pushing for a T-SPLOST last fall because the tax could fund infrastructure improvements without a property tax hike. He sold the concept by arguing that county visitors would carry a significant portion of the burden, particularly people who drive from Chattanooga to Costco. The tax was projected to create $60 million over five years. Catoosa County would get $42 million, while Fort Oglethorpe would get $12 million and Ringgold would get $6 million. County and city officials released non-binding project lists, with the bulk of the money going to road pavings. Opponents argued that a sales tax increase puts a disproportionate burden on the poor and elderly on fixed incomes. They also argued the county commissioners should be prioritizing more of their general fund and other sales tax funds to infrastructure projects, rather than introducing a new tax. If passed, T-SPLOST would have raised the overall sales tax rate in Catoosa County to 8 percent (including the standard 4 percent state sales tax). That includes a 1 percent Special Purpose Local Options Sales Tax, a fund that is supposed to go toward capital projects — including infrastructure improvements. Out of the county's current $27 million general fund budget, about $2.4 million is designated for roads and bridges. Of the $42 million the county expects to get from current SPLOST, about $11.4 million is budgeted for roads and bridges. With loud opposition to the tax, the county commission held a special called meeting March 12 and voted to commit to a $12 million bridge project in the Graysville community — but only on the condition that voters approved T-SPLOST. Located in the north end of the county, the bridge would run over the railroad tracks, which have become notorious for creating long delays. With endorsements from Sheriff Gary Sisk and county schools Superintendent Denia Reese, the commissioners said the county could afford the bridge project only with the extra 1 percent tax. "This was our one chance," Cutler said Tuesday night. Voters in Dade County rejected a T-SPLOST in May, 1,505-1,079. In Walker County, meanwhile, voters approved the tax in November 2017, 2,622-1,122. Contact staff writer Tyler Jett at 423-757-6476 or tjett@timesfreepress.com. Follow him on Twitter @LetsJett. CORRECTION: An information box incorrectly said that the top two vote-getters in the Trenton police commissioner race would compete in a run off election, because nobody received more than 50 percent of the vote. While a majority threshold is required in most races in Georgia, Trenton Mayor Alex Case said the city charter dictates that there are no runoffs in Trenton municipal elections. With 86 votes, Kirk Forshee is Trenton's new police commissioner.